Abstract: More often then not there really isn't much room to grow a health profit margin. Things like monitors however can mean the difference between a 3% and a 5% markup for the retailer. Most first time buyers of non-brandname computers get whichever monitor the particular retailer decides to throw in to me the markup quota. More often then not, things like mice, keyboards and the like are so cheap there really isn't much room to grow a healthy profit margin. Things like monitors however can mean the difference between a 3% and a 5% markup for the retailer. One such monitor which often gets included in these types of deals are the incredibly inexpensive Proview Brand. Let me just say right now that these monitor appeal to the very-low price market. The 17" PX-772 we're looking at today goes for little over $200CDN. And hey any 17" is better then nothing... or an old 15". The Proview PX-772 monitor, a 17" 0.28mm dot pitch monitor. The PX-772 comes with warranty, instructions, and power cord. Cost is ~$220 CDN. Previously we've reviewed bigger 19" beasts targeted at the high end graphics and workstation market. On the opposite hand we have the Proview PX-772, a 17", 0.28mm dot pitch monitor. 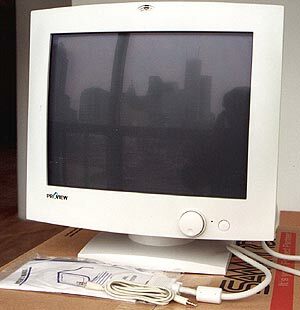 The PX-772 is a mid to low end monitor manufactured by Proview International Holdings.